What are the Fortnite Ice Storm challenges and how do you complete them? In case you hadn’t noticed, the Fortnite Ice Storm event has gone live, turning the entire battle royale map white with thick snow, and – much more importantly – unleashing a fresh set of Fortnite Ice Storm challenges for players to complete over the coming days and weeks. Most of the Fortnite Ice Storm rewards are XP dumps, but there are a couple of awesome cosmetic rewards to unlock if you grind through all of them, such as one of the cleanest Fortnite Wraps released so far, and the Winter’s Thorn Glider. 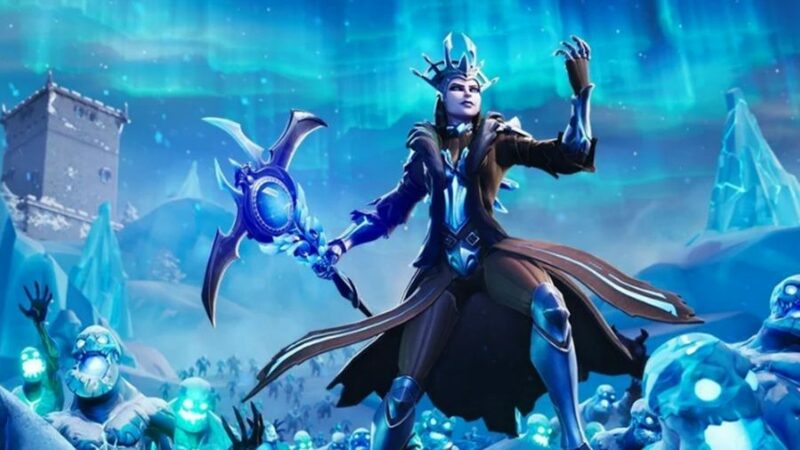 As with the Fortnitemares challenges, the Fortnite Ice Storm event will roll out over the course of a few days, with new couplets of challenges releasing every day. Today, two more challenges have been unlocked, bringing the total to four: Destroy Ice Fiends (0/250), Deal damage with Explosive Weapons to Ice Legion (0/5,000), Destroy Ice Brutes (0/100), and Deal damage with Assault Rifles or Pistols to the Ice Legion (0/10,000). There is a fifth challenge, which is simply to complete six Ice Storm challenges, which will net you the Blue Metallic Wrap. If you exclude the Wrap challenge then there are a total of 12 Fortnite Ice Storm challenges to complete. Fortnite News on Twitter has a screenshot of the updated challenge list, below. So, how do you take down those Fortnite Ice Fiends? First, you’ll need to locate Fortnite Ice Shards around the map. These are littered all over the island and act as spawners for the various Ice Legion enemies you’ll face during the event. Once you’ve located a spawner simply hang around and keep dealing damage to Ice Fiends with whatever weapons you have. Ice Brutes are the bigger, tankier versions of Ice Fiends, and they’ll show up in the same places – there are just fewer of them per location. Undoubtedly one of the next Ice Storm challenges will be to destroy Ice Shards, so knowing that the Boombox item deals damage to the shards and distracts Ice Legion monsters is handy info. This will also make dealing damage with explosive weapons even easier as all your enemies will be grouped up around the Boombox. Don’t forget to come back tomorrow for help completing the next set of Ice Storm challenges, which will unlock exactly 24 hours after the event live, which is 19:00 GMT. Until then, good luck and don’t eat the yellow snow!